The Grasshopper Company is committed to supporting state and local government agencies, schools and higher education, and nonprofit organizations through customer service and dependability. Grasshopper provides grounds maintenance solutions including a wide selection of True ZeroTurn™ mowers that accept several all-season implements for a perfect year-round grounds maintenance machine. Proven, dependable implements extend the usefulness of Grasshopper FrontMount™ power units for year-round productivity. Implements include snowthrowers, turbine blowers, brooms, aerators, sprayers, etc. We have distribution channels that have been in place for over 40 years and we understand the challenges with handling contracts all over the U.S.
A large network of authorized dealers support the sales and distribution of Grasshopper mowers. Look for a dealer near you. Grasshopper maintains a fleet of trucks delivering to our dealer network throughout the U.S. Products come crated and the dealer performs set-up and pre-delivery inspections before delivery to the customer. Grasshopper mowers are a great investment. Their quality and performance are second to none in the turf industry. They are built to last and are easy to maintain. While there are many combinations of models to choose from, there are a large number of common parts that help to keep training time and expenses low and parts inventory down. 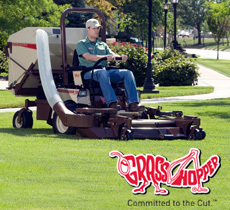 Grasshopper mowers are easy to operate, and are designed with many built-in comfort features that reduce fatigue to keep operators alert all day long. Grasshopper has earned the Equipment Dealers Association’s Dealer’s Choice award in the outdoor Power Equipment Manufacturer category two years in a row (2015 & 2016). This award evaluates manufacturers in areas of technical support, parts availability, warranty procedures, marketing and advertising support, and manufacturer response to dealer needs and concerns. Grasshopper mowers can be customized to meet your specific needs with choices of fuel, engines and horsepower, and cutting widths. All mowers are CARB and Tier 4 Final-compliant and meet ANSI B71.4 and OSHA 1928 standards. Gasoline-powered, air-cooled Grasshopper mowers with V-twin engine choices from 724 cc (24 hp) to 993 cc (35 hp), and cutting decks ranging from 41 inches to 72 inches. Gasoline-powered, liquid-cooled Grasshopper mowers with 3-cylinder, 962 cc (29 or 32 hp) engines, and cutting deck from 52 inches to 72 inches. Diesel-powered, liquid-cooled Grasshopper mowers with 3-cylinder engine choices of 719 cc (21 hp) and 898 cc (25 hp), and cutting decks from 48 inches to 72 inches. Gasoline-powered, air-cooled Grasshopper mowers with V-twin engine sizes ranging from 694 cc (23 hp) to 993 cc (35 hp), and cutting decks available from 48 inches to 72 inches. Gasoline, liquid-cooled Grasshopper mowers with 3-cylinder engine sizes of 962 cc (29 or 32 hp), and cutting decks from 52 inches to 72 inches. Diesel, liquid-cooled Grasshopper mowers with 3-cylinder engine choices of 719 cc (21 hp) and 898 cc (25 hp), and cutting decks from 48 inches to 72 inches. We offer diesel-powered options in both our MidMount™ and FrontMount™ mowers in addition to gasoline. Much has been written about alternative fuels. Did you know that running clean diesel is the best alternative? Grasshopper was the first in the industry to put diesel engines on zero-turn mowers back in 1983. The benefits of diesel begin with lower emissions – lower than propane! 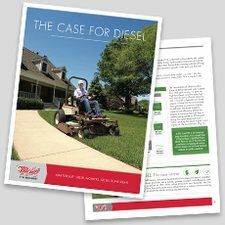 Another benefit of diesel power includes increased productivity thanks to its higher torque that lets you power through heavier or wet grass at faster ground speeds without sacrificing cut quality. The benefits don’t stop there. Grasshopper MaxTorque™ diesel mowers feature significant fuel savings, and diesel engines are more durable and last longer than either gasoline or propane engines. Cutting decks are 5.5 inches deep and deliver a manicured cut that is sure to satisfy your constituency thanks to superior airflow. One deck does it all and can convert from side discharge to DownDischarge™ mulching or vacuum collection without requiring a dedicated deck. Exclusive PowerFold® electric deck lift on FrontMount™ decks raises the front of the deck to a near vertical position for easy cleaning and blade replacement. The decks are built with heavy-gauge, geometrically formed steel construction. The anvil-edge design on the front of the deck includes an additional layer of formed steel angled around the bottom of the leading edge making it 1/2-inch thick for long-lasting performance. Massive 8-inch Sentry™ spindles are anchored to double layers of robotically welded steel forming a nearly one-inch-thick spindle plane. The 6-bolt pattern of the spindle spreads the force of impact for greater strength and durability. Dedicated rear discharge decks let you trim on either side of the deck while putting clippings on the grass and off sidewalks and parking lots, and out of flower beds. PowerVac™ Collection Systems are available for every Grasshopper zero-turn mower. They efficiently pick up grass, leaves and other debris leaving a professional, finished cut when you mow. Each system features a deck-driven vacuum with a trash-ingesting steel impeller that collects clippings and debris as they are discharged by the blades and propels them into a choice of rear-mounted collectors in choices of mesh bag or metal hoppers. Capacities range from 8 to 25 cu. ft. The metal hoppers can be emptied from the operator’s seat. The HighLift™ 15B collector electrically raises 72 inches to easily empty into truck beds. The QuikConverter™ Implement System makes it easy to remove the deck and add PTO-driven implements that take advantage of the Grasshopper power unit’s powerful engine. This design leaves only one engine to maintain compared to purchasing and maintaining multiple single-purpose machines. Having only one engine to maintain reduces maintenance, training, labor and parts inventory. The zero-turn maneuverability of these grounds maintenance systems pays off in time and labor savings. Choose professional-quality implements for aeration, blowing leaves, dethatching, edging, moving dirt and gravel, spraying, and sweeping sidewalks and parking lots. Snow removal implements include dozer blades, rotary brooms, snowthrowers and V-plows. A metal fully-enclosed winter cab enclosure can be added to protect the operator from the cold winter elements. Several implements mount to the mower taking advantage of the zero-turn maneuverability and increasing the productivity of your FrontMount™ mower well beyond the cutting season. AERA-vator™ for coreless aeration that leaves no cores to clean up. Available in 40- and 60-inch sizes. Dozer Blades with choices of 48- and 60-inch widths that angle 25 degrees left or right. Rotary Brooms available in 48- and 60-inch widths. Manual or powered versions that angle 25 degrees left or right or straight ahead. Snowthrowers available in 48- or 60-inch widths. These single-stage units will throw snow up to 30 feet. The Turbine Blower with rotating blower nozzle generates up to a 150-mph air velocity to move large piles of debris. The 60-inch V-plow makes quick work of cleaning sidewalks by moving snow in two directions at the same time eliminating the need for a second pass. Fully-enclosed Metal Winter Cab protects the operator from the elements. Joystick control mounted on the steering lever provides full control of the Snowthrower, Rotary Broom, Dozer Blade or V-plow from the comfort of the cab. Edge-EZE™ Edger mounts on either side of the mowing deck to maintain clean, sharp edges along sidewalks, roadways and driveways while reducing trimming and edging time up to 75 percent. Shielded Sprayers double or triple spraying efficiency by delivering a fine mist on vegetation even in windy conditions thanks to the spray shield. Available in 132-inch (FrontMount™ only) and 53-inch widths. Sunshade Canopy shields the operator from direct sunlight and reduces eye strain. Available in lightweight, water repellent and UV-resistant vinyl or diamond-plated aluminum. Easily mounts on the ROPS. Tine-Rake™ Dethatcher mounts on the front of the deck and uses spring steel tines in a unified raking motion to remove large amounts of thatch. Available in 46-inch and 60-inch models. Combine with our PowerVac™ Collection Systems to dethatch and pick up in one pass. We were one of the first mower manufacturers to implement powder coat paint, we are able to reclaim many of the environmental hazards associated with traditional painting operations. Grasshopper continuously invests in advanced technologies for cutting, bending, punching and welding. Laser-cutting technology is used to achieve the perfect cut while increasing usable yield for every sheet of metal that goes through the plant, obtaining up to 89 percent usable material resulting in a 15 percent decrease in raw material consumption. All scrap metal is collected and sent to a recycling facility. Wood pallets are used for shipping mowers across the U.S. and offer a reusable and renewable source for crating. Automotive style, sealed and maintenance-free batteries can be recycled easily at auto parts stores nationwide. Grasshopper introduced the industry’s first liquid-cooled, diesel-powered zero-turn mower in 1983. Diesel-powered mowers offer superior power, cost efficiency, convenience and lower operating costs than a comparable gasoline or liquefied petroleum gas (LPG) engine. Electronic Fuel Injection (EFI) engines are available that reduce gasoline consumption and emissions. In 2012, Grasshopper received the Pollution Prevention (P2) Award from the Kansas Department of Health and Environment (KDHE). The company was selected due to its implementation of high precision laser technology and the nesting software that runs it, and inspection tools that eliminate waste. These new processes have helped to reduce consumption of raw steel by over 142 tons in 2012 alone compared to the previous year. How do I contact Grasshopper to learn more? What products are offered through the mower contract? We offer a lineup of zero-turn mowers and all-season implements and accessories for year-round grounds maintenance and renovation. Visit Products & Solutions to learn more. Can public agencies lease mowers as well as purchase? Public agencies may lease mowers. We contract with a third party leasing company and supply options based on the contract price. How does Grasshopper handle shipping/pickup/setup fees? Shipping/pickup/setup fees are included in the terms of the contract. Dealers should not charge additional such fees on the OMNIA Partners contract. What about parts and service? Your success is our number one priority. A nationwide network of factory-authorized dealers support the sales of Grasshopper products and provide parts and service. A specialized parts order system can be customized for the government entities. How can I get a demonstration of your products? Nearly 70 factory representatives and field support staff cover all 50 states plus Puerto Rico and the U.S. Virgin Islands and are equipped to conduct on-site demonstrations. In addition, our authorized Grasshopper Dealers are also available to demonstrate our products. What is the warranty on your mowers? Are diesel mowers a good investment? Grasshopper has led the industry in diesel power having introduced the first diesel-powered lawnmower in 1983. Today’s diesel engines burn cleaner than gasoline or propane and use about a gallon of fuel per hour. Gasoline consumes 1.65 GPH and propane 1.80 GPH. Using diesel power can reduce fuel consumption by 600 or more gallons per year based on 1,000 hours of mowing. Additionally, diesel engines produce more torque than their gasoline or propane counterparts. This additional torque lets you power through heavy or wet grass quicker, allowing you to get jobs done faster, letting you get more done in a day.